Arthur S. Henshaw3,5 [Arthur T. Henshaw6]. Henshaw, Arthur S., head-of-household, age 30, born in New York; parents born in New York; first marriage, married 7 years; occupation: none; owned home (mortgaged). Henshaw, Cora M., wife, age 24, born in New York; parents born in New York; first marriage, married 7 years; 5 children, 4 living. Henshaw, Cecil M., daughter, female, age 5, born in New York; parents born in New York. Henshaw, Gladys P., daughter, age 3, born in New York; parents born in New York. Henshaw, Ether V., daughter, age 2, born in New York; parents born in New York. Henshaw, Mildred L., daughter, age 9 months, born in New York; parents born in New York. Henshaw, Tracy D., brother, age 22, born in New York; parents born in New York; single; occupation: laborer, farm work. Henshaw, Arthur S., head-of-household, age 40, born in New York; parents born in New York; rented home; occupation: farm labor, general farm. Henshaw, Cora M., wife, age 34, born in New York; parents born in New York. Henshaw, Cecil M., son, age 14, born in New York; parents born in New York; attended school. Henshaw, Gladys P., daughter, age 12, born in New York; parents born in New York; attended school. Henshaw, Ethel V., daughter, age 11, born in New York; parents born in New York; attended school. Henshaw, Mildred L., daughter, age 10, born in New York; parents born in New York; attended school. Henshaw, George M., son, age 7, born in New York; parents born in New York; attended school. Henshaw, Leona B., daughter, age 5, born in New York; parents born in New York; attended school. 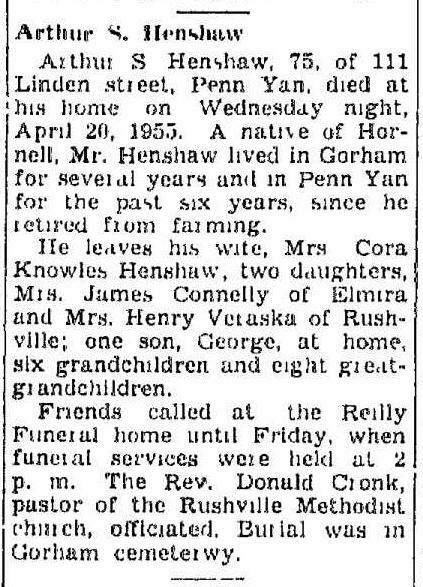 Arthur's obituary was published in the "Chronicle Express" (Penn Yan, New York) on April 28, 19555 (see scan below). 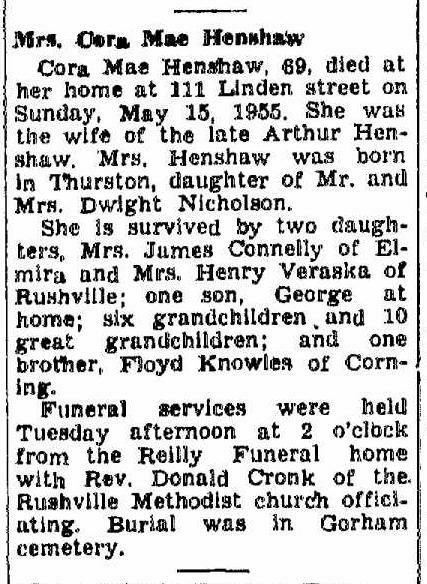 Cora's obituary was published in the "Chronicle Express" (Penn Yan, New York) on May 19, 19559 (see scan below). Arthur and Cora's deaths were reported in the "Chronicle Express" (Penn Yan, New York) on June 2, 195513 (see scan below). Contribution from Kelly Taft Krause (). 1910 census, Thurston, Steuben County, New York; roll T624-1080, ED 155, page 171B, line #83, dwelling #167, family #171. 1920 census, Thurston Township, Steuben County, New York; roll T625-1267, ED 135, page 4A, line #36, dwelling #84, family #86. 1920 census, Thurston, Steuben County, New York; roll T625-1267, ED 135, page 4A, line #36, dwelling #84, family #86. "Chronicle Express", Apr 28 1955; http://www.ancestry.com. 1880 census, Hornellsville, Steuben County, New York; roll T9-0933, ED 180, page 366A, line #33, dwelling #193, family #193. 1900 census, Thurston Township, Steuben County, New York; roll T623-1164, ED 105, page 11A, line #25, dwelling #228, family #231. "Chronicle Express", May 19 1955; http://www.ancestry.com. 1910 census, Thurston, Steuben County, New York; roll T624-1080, ED 155, page 171B, line #90, dwelling #168, family #172. 1920 census, Thurston Township, Steuben County, New York; roll T625-1267, ED 135, page 4B, line #52, dwelling #87, family #89. "Chronicle Express", Jun 2 1955; http://www.ancestry.com.